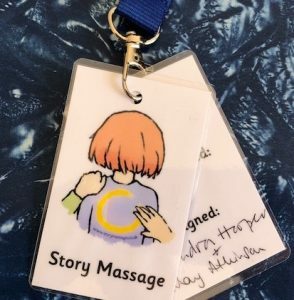 Story Massage Lanyards Available Now! Have you trained with us, either on the face or online? 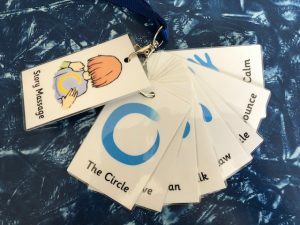 We can now offer you a Story Massage Lanyard with an approved and signed ID and/or a key ring with the ten strokes. 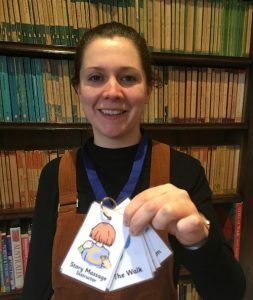 A blue lanyard with an approved Story Massage ID (see below). 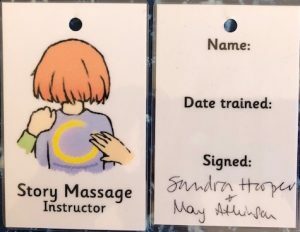 The back is personalised for you with details of your name, date trained and the signatures of the co-founders of Story Massage, Mary and Sandra. Your certificate will indicate which of these two lanyards is applicable to you. Any questions, just email us on info@storymassage.co.uk. Cost: £10 plus £2 p & p (UK rates). Please email us for overseas postage costs. 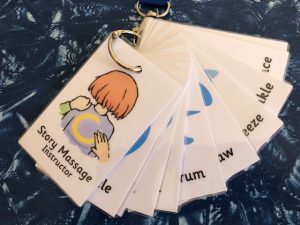 A blue lanyard with the ten Story Massage strokes. (see below). Cost: £20 plus £2 p & p (UK rates). Please email us for overseas postage costs. 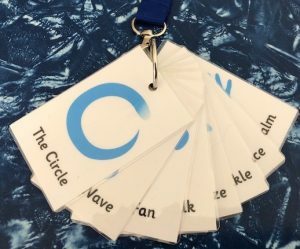 A blue lanyard with the Story Massage approved ID plus a key chain of strokes. (see below). Cost: £25 plus £2 p & p (UK rates). Please email us for overseas postage costs. We will issue you with an invoice and then arrange delivery of your order.